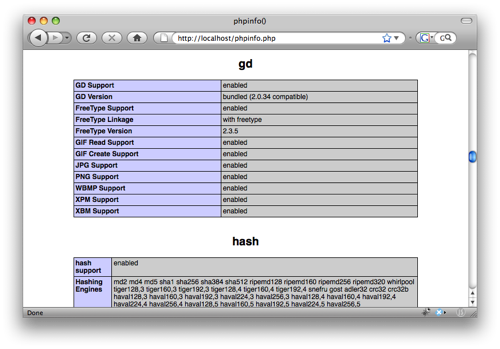 So, you need GD for your killer PHP web app, and you’re running Mac OS X 10.5? A quick look shows that GD doesn’t ship with Leopard. No worries. It’s pretty simple to install. There are a few core requirements you must take care of before getting started. Choose to ignore these, and you’re doomed to failure! Always back up your system before a command-line activity such as this. Update your system to Mac OS 10.5.5. I could detail how to do this with prior versions, but I don’t have time. Install the latest version of Apple’s Developer Tools: XCode 3.0+ for 10.5. XCode is available on your OS X DVD, or from Apple as a free download. X11 must be installed (it is by default), as well as X11 SDK (from the Developer Tools in step 3). DISCLAIMER: The author claims no responsibility for any damage that may occur from the use of any information found here or found on links followed from this document. If you choose to use this information, you do so at your own risk. 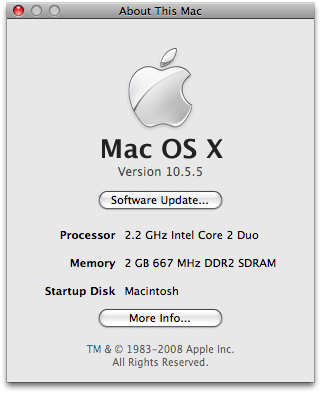 Mac OS X Leopard comes in two flavors, depending on the capabilities of your CPU — 32-bit or 64-bit. YOU MUST COMPILE FOR THE PROPER ARCHITECTURE. /usr/sbin/system_profiler SPHardwareDataType | grep "Processor Name:"
Make a note of whether your CPU is 32-bit or 64-bit, because you will be compiling software using vastly different settings depending on your CPU. The free image compression library, libjpeg, is required by GD. You now have compiled libjpeg! We will be using Apple’s Darwin sources for PHP, which interestingly contain the GD source code. Why Apple doesn’t ship with gd.so already compiled is known only to the maker. Again: YOU MUST COMPILE FOR THE PROPER ARCHITECTURE. Likewise, if your error refers to libpng12.0.##.#, you should create a symbolic link to libpng12.0.dylib. First, let me give you a couple of pointers about this file. It *probably* exists on your machine. If not, you should just create it as a simple text file. Directives in the file can be commented out by placing a semi-colon in front of the directive. Restart Apache to force the reloading of the PHP configuration file.